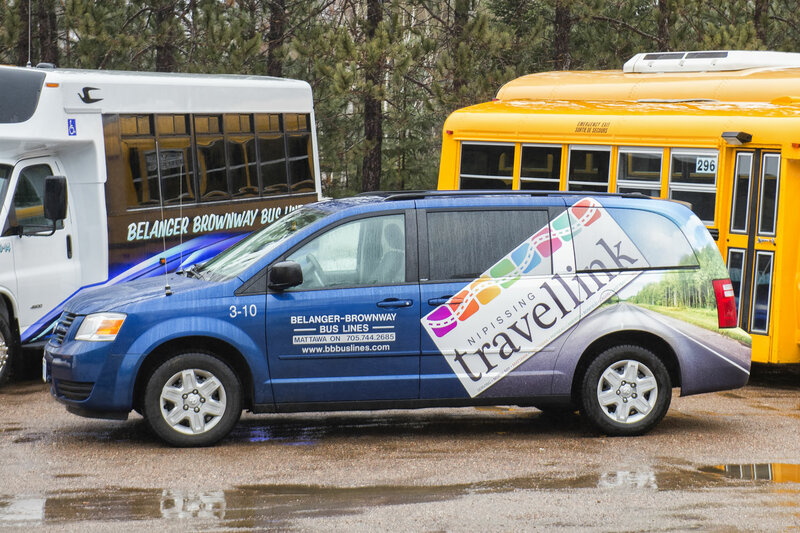 As a lack of transportation along the Hwy 17 corridor was suspected to be a barrier to employment and other activities in the Nipissing District, Belanger Brownway Bus Lines is proud to participate in Nipissing Travellink, a transportation pilot program offering passenger service between Mattawa and North Bay. 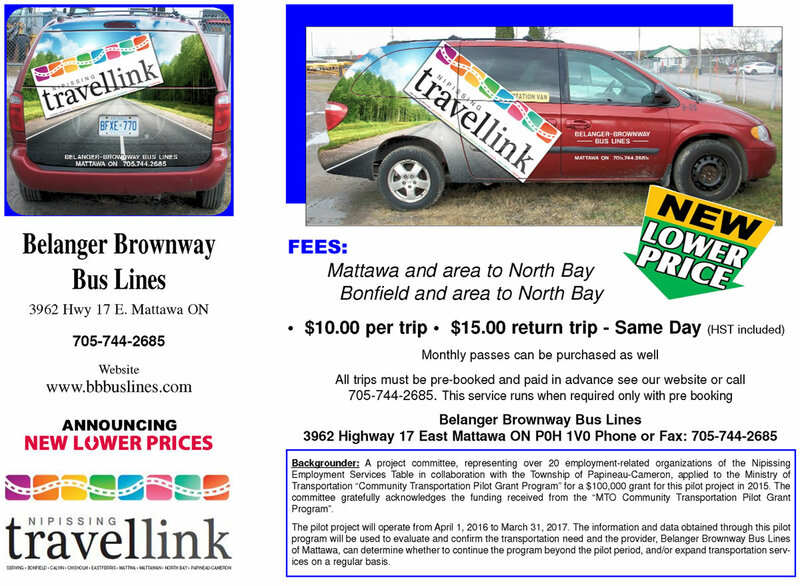 The passenger shuttle van will board and depart from Mattawa, stopping along the way to pick up passengers, and arrive in North Bay. The return trip will leave North Bay arriving back at the Mattawa. For fees and Travellink Schedules, please visit our STORE page. Pleased to announce (Lower Pricing). Official ribbon cutting announcing new transportation services. A project committee, representing over 20 employment-related organizations of the Nipissing Employment Services Table in collaboration with the Township of Papineau-Cameron, applied to the Ministry of Transportation “Community Transportation Pilot Grant Program” for a $100,000 grant for this project in 2015. The committee gratefully acknowledges the funding received from the “MTO Community Transportation Pilot Grant Program”. The pilot project will operate from April 1, 2016 to March 31, 2017. The information and data obtained through this pilot program will be used to evaluate and confirm the transportation need and the provider, Belanger Brownway Bus Lines of Mattawa, can determine whether to continue the program beyond the pilot period, and / or expand transportation services on a regular basis. 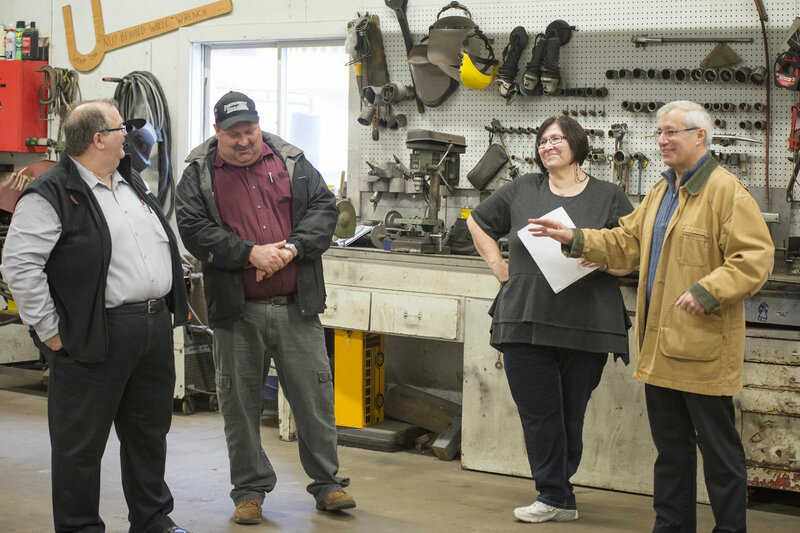 Pictured below from left to right: Belanger Brownway Bus Lines Owners, Dan Belanger, Mike Belanger and Shirley Belanger with MP Vic Fideli.